Just a few ingredients can provide a family-friendly balance of sweet (maple syrup) and savory (oregano and butter). Serve this with a salad and either couscous or rice. 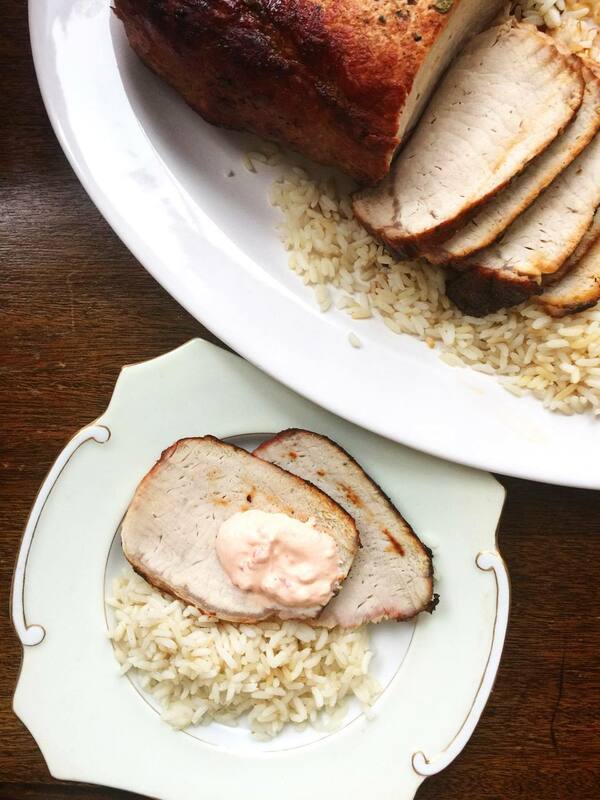 I'm a huge fan of pork loins, which are an inexpensive, easily available, and versatile cut of pork. Leftovers are great thinly sliced into a sandwich or chopped and added to a stir-fry. Even though they have pork is not seasoned with Asian flavors, the delicate seasonings will happily blend into the new dish. The simple sauce is just sour cream thinned with a bit of milk and brightened with a little Sriracha. You can use any hot sauce you like, and adjust the amount as desired. Pass the sauce on the side and let everyone help themselves to as much or as little as they like – or just keep passing it down the table. Preheat the oven to 375 F. Pat the pork loin dry with paper towels and season it generously with salt and pepper. Heat a heavy, ovenproof skillet over high heat. Add the oil then sear the pork loin on all sides, for about 3 minutes per side, until the outside is all nicely caramelized. Remove the pork loin to a plate, pour off the remaining oil in the pan, then return the pan to medium heat, and add the butter, maple syrup and oregano. When the butter melts, return the pork loin to the pan and roll it in the butter mixture, using tongs, and even dip the ends into the pan sauce. Leave the pork in the middle of the pan and add the broth. Transfer to the oven and roast for about 50 minutes to 1 hour 10 minutes (it really depends on the thickness of the pork loin), until it reaches a 145°F internal temperature in the thickest part of the roast (use a meat thermometer to check temperature). Turn the roast over after the first 30 minutes of cooking. While the pork is cooking, in a small bowl mix together the sour cream, Sriracha, milk and salt and pepper. Remove from the oven and let sit for 10 minutes before thinly slicing. Serve with the sauce.